Diarmuid was born on 14 Oct 1900 at 48 Quaker Road, Cork City, second child after Eileen, who was born in 1898. On his Birth and Baptism certificates his name is given as Jerome. His father was Daniel McCarthy and his mother was Margaret nee McCarthy, but not related. They were from the parish of Caheragh, north of Skibbereen. Daniel was in the RIC, and so was stationed in the East region of Cork. He must have been stationed around Cork City when Diarmuid was born, but I don’t know where precisely. He retired from the RIC in 1915. Daniel died in 1924, and Margaret in 1936. They are buried in St Finbarr’s Cemetery in Cork. Diarmuid was born on 14/10/1900 and baptised the next day in the parish of St Finbarr’s South by Fr. Mark Leonard. Godparents were Florence McCarthy and Frances McCarthy. 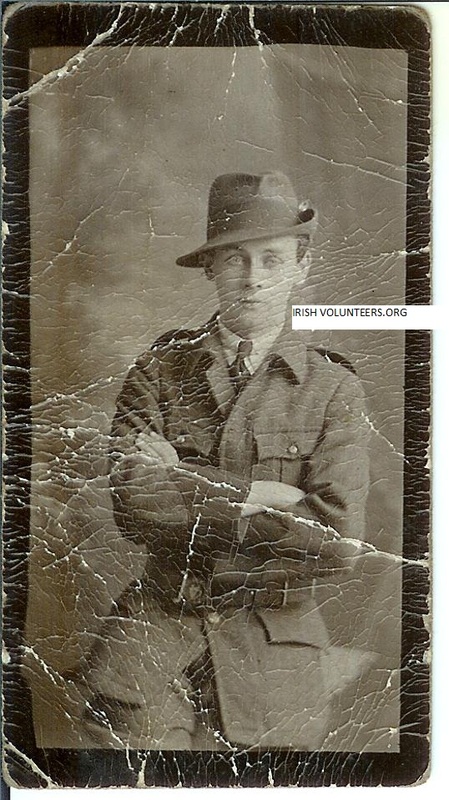 He joined the Irish Volunteers. – this photograph shows him in uniform. He was engaged to Kathleen Moore, but died in 1933. His death certificate is in the name of Dermot McCarthy, bachelor, Civil Servant, who died at St Vincent’s Hospital. His address was “Loughereen”, Hill of Howth, Dublin. Cause of death: Pneumonia (10 days) and cardiac failure. The informant was “P McCarthy, Brother” (my father) of the same address. They were both in lodging there. Diarmuid is buried with his parents in Cork. My father, Patrick (born same address in 1903), was active, in A (University College Cork) Company, 2nd Battalion, Cork I Brigade, Oglaigh na hEireann (IRA) during the three months which ended on 11th July, 1921. He was doing engineering in UCC, and took “time out”! He said he was active in North Cork, as far as I remember, but that seems unlikely if he was in a UCC company. He said very little about it. He had the marks of a bullet wound in the calf of his leg and we have no photograph of him in uniform. That’s as much information as I have at present.